One wooden paint stirrer for each student from hardware section of store. Paint the top (handle section) of the paint stirrer black. When dry, paint remainder of stick white. Paint a craft (popscicle) stick black. Allow to dry. Hot glue the craft stick across the paint stirrer where the black and white paints meet to serve as the brim of the hat. Use fine tip markers to draw face details. Tie on a fabric scrap for a scarf. Optional: glue on a loop of yarn for hanging. Take a 2 liter plastic bottle. Paint it white or pour white paint inside and let children roll it around until the bottle is covered with white paint. Put on eyes, nose and mouth. You can get as creative as you like. Dip a blown-up balloon in white tempera paint. Make two prints on blue construction paper, one for the body and one slightly smaller for the head. 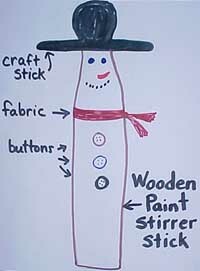 Decorate by using scraps - add a hat, scarf, facial features, and buttons. Use doilies on blue construction paper to make snowmen, one size for the body and a smaller one for the head. If you have a craft project that would be of particular interest to fellow teachers, please consider sending it to editor@teachers.net.